The key to C.M.T. success is customer care. The whole company staff must be focussed on the customer’s requirements, needs, expectations and be dedicated to their fulfilment. For this reason we have been working according to a quality management system for years. We consider this a strategic choice and are actively committed to ensuring its compliance and development. 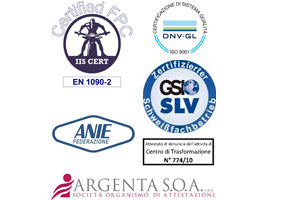 Our welders are qualified by IIS in compliance with the norm ISO 9606-1. We follow welding procedures according to ISO 15614. Our personnel is qualified to perform non-destructive testing on welds in compliance with ISO 9712.